Injustice towards Palestinians evolves over time. In 1948 Palestinians lost claim to full ownership of British Mandate Palestine; they then lost control of the West Bank, Gaza and East Jerusalem in 1967; and in 2018 they saw the end of US policy on East Jerusalem as the future capital of a Palestinian state. Israel gains control over Palestinian assets with ingenious methods of manipulation: invasion of land, confiscation of property, redrawing of maps, the invention of laws, annexation of land, establishing of settlements, erection of checkpoints, construction of walls and revision of history. Israelis are impatient with the sheer presence of Palestinians. The 1.4 million Israeli citizens of Palestinian descent (1 of 5 residents) are labeled “Arab Israelis”. Their Palestinian nationality is informally denied by the generic term “Arab.” Last week the Knesset (parliament) passed the highly discriminatory Nation-State Law; this is the latest step in downgrading the rights of the Arab citizens of Israel. With the passage of this new law, Israel becomes the national home of the Jewish people, exclusively. The right to national self-determination now rests only with the Jewish people. Arabic has been reclassified as a “special” rather than an official language. And last week, Israel’s Washington lobby pushed for legislation in the House of Representatives for US recognition of Israeli sovereignty over the (occupied Syrian) Golan Heights. Democracy suffers, and moderates are discouraged in the Holy Land. Prime Minister Netanyahu assumes that the rights of Palestinians will erode with the passage of time, with more laws, and with further weakening of Arab states. Netanyahu exploits divisions among Palestinian leaders and counts on a continued Saudi-Iranian conflict, a sanctioned Iran, a weak Syrian government, a troubled Iraq, a misguided Egyptian leadership, a disastrous Yemeni war, and a chronic condition of Arab fratricide. Despite their military advantage, prosperity and strong international ties, Israel’s current leaders have a near-paralyzing fear of the future. They are obsessed with changing Arab demography. However, Israel’s expanding colonial policy cannot be explained by the fear factor alone. Power corrupts. It is hard to relinquish power once it is achieved. Regardless of what underlies Israeli political behavior, Palestinians could choose not to participate in fueling the Jewish fears, whether with knives or rifles. Palestinians can possibly shift the political winds to their favor by unifying their resistance movement through public protest and other forms of nonviolent action. The United Nations has also chosen to favor the Israelites. In 1947, the United Nations announced a partition plan offering a majority population of Palestinians 44% of the land they inhabited; the minority Jewish population was offered 56%. In this first attempt at managing the Palestine Question, the UN unwittingly set a precedent of injustice. This negative bias toward Palestinians has not changed significantly over the past seven decades. The peace plan of President Trump, Jared Kushner and Benjamin Netanyahu, which has been advertised as the “deal of the century,” looks more like a real estate scheme. 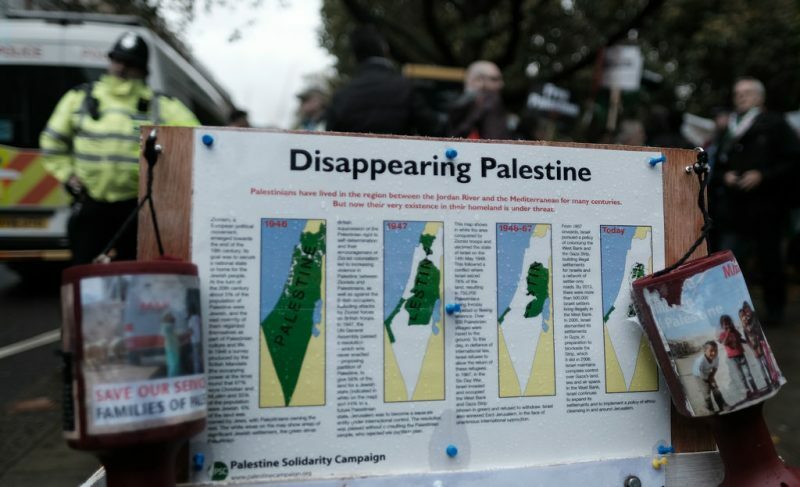 The scheme offers Palestinians only a limited portion of the Occupied Territories, but no statehood, no recognition of Rights of Return and no East Jerusalem. It also imposes many restrictions on self-defense, mobility, and economic viability. Trump, Kushner and Netanyahu consider Palestinian land as assets for sale, a distress sale. They have done their hard-sell marketing. Saudi Crown Prince Mohamed Bin Salman, hoping the Palestinians are willing to accept the deal, is poised to finance it. The Saudi prince ought to know better: Palestinians are not in the market for auctioning their destiny. They are fed up with the empty promises of a clueless US president, his inexperienced son-in-law and an Israeli leader who has never shown willingness for peacemaking. While Israel is not in a rush to end the occupation, Palestinians cannot afford to delay constructive struggle for liberation. Due to the strength of their moral case and the weight of their demography Palestinians are actually capable of breaking a vicious cycle of mutual distrust. Perhaps Palestinians have depended for too long on outsiders for leading the peace process. United by a political platform of nonviolence, Palestinians can pressure Israel to consider peace terms. They might be able to achieve a breakthrough by abandoning any form of resistance which either fuels Israel’s fears of the future, or gives hawks the excuse not to take serious steps for peace. The peace plan of the Trump team is a zero-sum deal. Are the Palestinians inspired to reorient their resistance to achieve their aspirations? Burning the Quran and the Satanic Verses: Is there a difference?